Yakov Smirnoff, who shot to international fame playing opposite Robin Williams in Moscow on the Hudson, Tom Hanks and Shelly Long in The Money Pit, Meryl Streep and Jack Nicholson in Heartburn, Richard Pryor and John Candy in Brewster’s Millions and as Yakov Korolenko in the award-winning TV sitcom Night Court, returns to the Branson stage. The comedy legend will bring his “Make America Laugh Again” tour to Branson October 13th – November 24th at Yakov’s beautiful Branson theatre. 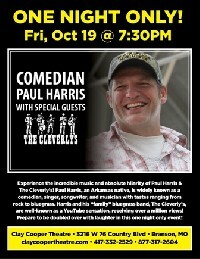 Experience the incredible music and absolute hilarity of Paul Harris & The Cleverly’s! Paul Harris, an Arkansas native, is widely known as a comedian, singer, songwriter, and musician with tastes ranging from rock to bluegrass. Harris and his “family” bluegrass band, The Cleverly’s, are well-known as a YouTube sensation receiving over a million views! 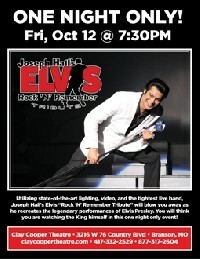 Prepare to be double over with laughter in this one night only event!